The Brickade is roughly based on the military Navistar and on the [http://en.wikipedia.org/wiki/RG-12 RG-12 APC] produced by Land Systems OMC. Its a large but stumpy and generic [[wp:Armoured bus|armored bus-like]] van, similar to the [[Securicar]] (which interestingly bears a similar "Stockade" badge), but adopts a cab-over design, a beige bodywork and much smaller wheels. In addition to a thick body shell, the Brickade is also equipped with plating that protects the front radiator grill, as well as steel mesh grating covering the front windscreen and wheel wells (which does not actually protect the Brickade's tires from gunfire). The Brickade is implied to be associated with the [[LCPD in GTA IV Era|police]], as it has a [[Police Radio|police radio]] and the ability to pass through [[tollbooths]] without paying. However, unlike most police vehicles, the Brickade can use a [[Pay 'n' Spray]]. Although it bears no badging, police chatter implies the Brickade is manufactured by [[HVY]]. Despite it having two doors in the front and two doors in the back like the Stockades, it can only fit two people in it as the back doors are not programed to open and fit people in the back like the stockades can, they will only open upon heavy impact. This is because the Brickade is a unfinished project which will make it notible for missing a few details. The Brickade is roughly based on the military Navistar and on the RG-12 APC produced by Land Systems OMC. Its a large but stumpy and generic armored bus-like van, similar to the Securicar (which interestingly bears a similar "Stockade" badge), but adopts a cab-over design, a beige bodywork and much smaller wheels. In addition to a thick body shell, the Brickade is also equipped with plating that protects the front radiator grill, as well as steel mesh grating covering the front windscreen and wheel wells (which does not actually protect the Brickade's tires from gunfire). The Brickade is implied to be associated with the police, as it has a police radio and the ability to pass through tollbooths without paying. However, unlike most police vehicles, the Brickade can use a Pay 'n' Spray. Although it bears no badging, police chatter implies the Brickade is manufactured by HVY. Despite it having two doors in the front and two doors in the back like the Stockades, it can only fit two people in it as the back doors are not programed to open and fit people in the back like the stockades can, they will only open upon heavy impact. This is because the Brickade is a unfinished project which will make it notible for missing a few details. The Brickade suffers from poor speed on average due to poor acceleration, but can reach slightly above average top speeds after uninterrupted and prolonged acceleration. Its steering also varies; due to its shorter wheelbase, strong torque and rear wheel drive, the van can execute tight turns in low speeds, but this trait is hampered as the vehicle travels in higher speeds and increases its inertia. Similarly, its brakes are reliable when the vehicle travels slower, but requires a moderately longer stopping distance when braking in higher speed (although they still fare better than those of the Ripley). Regardless, the Brickade's heavy weight allows it to push smaller and lighter vehicles out of the way with ease. The Brickade is also considerably hardened to handle selected forms of damage to an extent, to the same degree as the Enforcer, Police Stockade and Securicar. The vehicle can absorb large amounts of gunfire, but will eventually succumb to engine damage, especially when it is shot at its weakest point in the front, where the engine is. The Brickade can also survive six direct hits from explosive shotgun rounds (at any part of the vehicle) before its gas tank ignites and results in the vehicle exploding (three times the amount of a regular car). The Brickade shares the same engine sound and interior with the Ripley. The Brickade was originally going to be featured in multiplayer. 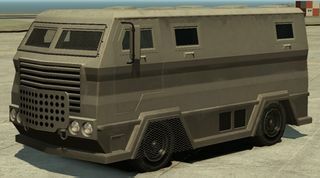 It could be used in roadblocks for the bridges at a 6-star wanted level only in Free Mode and was to also be found on the streets. One possible reason Rockstar removed it is because in the game files it says that firemen were to drive it, then once it was fixed it would not spawn at all. Rockstar may have decided it would be better to remove it. The Brickade is the most durable front engined vehicle in the GTA IV Era.